Everything about this saree is so quintessentially South Indian - yard after yard of the purest Indian cottons weaved painstakingly by hand, its indescribable ivory shade set off to perfection by the resplendent gold of the border. Kasavu is an endemic technique of weaving whose origins lie in the Buddhist era of South Asia, having caught up with the Malayaalee people of South India like wildfire. No wonder when one hears the words 'South India' or 'Kerala', a fleeting image of the ivory-fabric-gold-border entity comes to mind. 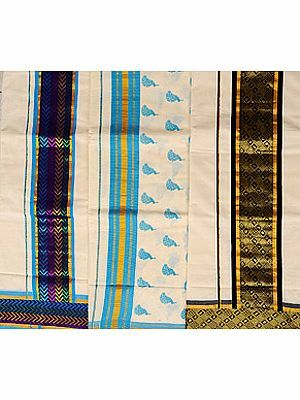 Of the numberless varieties of sarees made and draped across the subcontinent, each with its own enticing set of traditions, kasavu cotton ones are meant to be worn during ritual worship.